It would sound a bit like knocking at an open door to start by stating that the place, the site, the geography are very important aspects of field-recording practices. 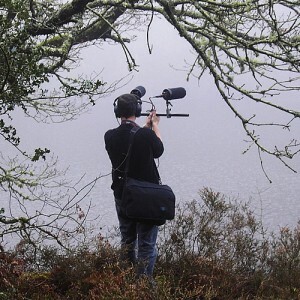 One might even say that the recent and combined democratization of hand-held recorders and that of geolocating technologies have something to do with the fact that ‘field-recording’ is now identified – for the better or worse – as a proper discipline. However, by the time every bit of sound comes with a location tag or is positioned on a map, very few sound artists or recordists have produced a critical approach of the tools and theories of sound geography. Cédric Peyronnet (a.k.a Toy.bizarre) is one of the few, that is why I wanted to interview him through that perspective of what the work of a sound geographer might be. — What are the common issues between the music you used to make as Toy.Bizarre, your more recent works and your publishing concerns with the label Kaon? What has evolved, what has changed? It seems to me the question of the ‘place’ has became central, maybe up to the point it has ruled out some aspects of your previous approach. Curiously enough, even today I’m not so sure that the issues of my work are a matter of sound. The object of study that is remaining constant has more to do with the place: I’m trying to conceive a form of geography, even though I know that I still have a long way to go. My first works, which I did under the name of Toy.Bizarre (an atmospheric Musique Concrète), were not entirely satisfying to me. That’s why I ended splitting my sound activities according to different projects. Then it became a very pragmatic question: I did not have enough time so I had to focus on one aspect of work, and it was the one dealing with this question of the place that remained. As a consequence I ended leaving the rest of my work aside, with the exception of a few fragments that come to surface again from time to time. Actually the place was already a central question in my first works. In this way, it was entirely related to my ‘fixations’ on a few places and with my interest for geography, in the broad sense of the term. In fact, I would be able to explain all my work with one simple cue, something I experienced at age 5 or 6: a stream at the bottom of a narrow valley, at the end of winter, soaked by rain, under a clear sky. Everything is there: something very real and also completely unsettling if you’re looking at it with varying notions of scale – the stream is a dash of water and already a river – the phenomena, the global morphology will remain with only this variation of scale. This is what I’m trying to do working with places and sounds. — Is this such a play on scales that initiates for you the issues of representation of a place, of its reproduction? Is it about making a landscape to fit in the picture, a river to fit on the record, a place to fit on the map? Yes, there is an utopia of that kind. A part of my work originates from the idea of model and clearly deals with the question of scale, and it is also the main issue in cartography. All of this is also connected by the idea of simultaneity (of time and space) that the model provides, whereas it’s impossible to obtain at ‘real’ scale. So this is also the way I approach sound. With the project entitled ‘kdi dctb 009‘, for example, I focused on a ‘place’ that was limited to 1m2. I think that this is actually what we are doing with sound: models, scaled-down ‘landscapes’ or other things. — The places that are appearing in your work are most of the time localizable, but one would feel your geography is a moving, a fluctuating one; that you are not claiming for the objectivity of the topographic or cartographic report… What are the tools, pratical as much as theoretical, with which you are approaching a place? Above all, it is a sensible approach – approach for which the tools are not easy to find and delicate to use. I’ve been looking into phenomenology a lot lately. I started with very tightly framed projects (using grid-patterns of x-meters long, places selected with multiple cross-references, etc). With the ‘Morvan-Auxois‘ project I reached a limit, maybe a saturation, in my use of various methodologies for territorial approach (through history, topography, toponymy, cultural zoning…) and that is why now I’ve decided to focus on the sensible approach. So, in this respect, I’ve used most of the tools that makes it possible to explore the sonic dimension of a place or landscape: I’ve been constructing some kind of theoretical grid, mixing elements of the World Soundscape Project with the research of Pascal Amphoux, for example. I am also looking into the field of ‘Time Geography’. And yet, for me the downside of most of these kind of works is that they tend to forget that, as we intend to study sound, we are actually only able to do so through an artifact, the recording, and that this artifact is already colored with our intentions. Recording is never something neutral, this is why the sensible aspect has to be carefully considered. — That issue of the recording acting as a ‘filter’ is constantly coming back with any form of mediation and representation. In the end, it seems that the objective approach must always fail and that, at some point, we need to reconsider our technical and cultural determinations, give some space to subjectivity and reflexivity. In his book, ‘Camera Lucida‘, Roland Barthes argues that the study of photography can only be achieve be reflecting upon one’s own subjectivity in front of the pictures… In that sense, would you say that a recording is more attesting of the singular encounter one might make with a place than it is able to say anything about the place itself? I had never thought about it like that. But yes, that would of course be the encounter that is the object of the recording. What interest would there be in the place alone, in the empty place? — What is the importance of cartographic and geographic elements in your work? Is it a way of working at the scale of the soundscape: finding the proper location where to stand? Is it a matter of composition: organizing the piece according to a geographic structure? Is it a poetic dimension: the imaginations that come with mysterious names of places? Is it a matter of fiction: inviting the listener to stand somewhere he would never go? Yes, it is all you are saying, with variations according to places and projects. The poetic dimension is fundamental and so is imagination – but not as a matter of restitution or simulation, which would not be the issue. Maybe the core idea would be to say something like: ‘everything is right there, so close, all inside that little square’. The cartographic dimension, that is: any phenomenon we would be able to locate and represent on a map, remains anecdotal for me, or at least it will be until I find a satisfying way to exploit it. About the issue of composition, I would say that it is probably more induced by sonic elements than it would be by the layout of the place. Then, of course, the place influences the charcteristics of sounds. Well, I’m saying that today, but I might change my mind tomorrow. — What is your relationship with new mapping technologies, the massive exploitation of topographic data and the current panoptic tendency of geolocating everything? Well, digging around, thinking in retrospect, it is now clear to me that they have no interest whatsoever for my sound work! Then for me, this is a broader question. Today I am completely detached from this technological trend, probably after a major overdose in the beginning of the years 2000. In the end, this excess of geolocation is only ridiculous and extremely narcissistic, it’s all about saying: ‘Yes, I was there!’. Then it all depends on what to put behind the notion of cartography: form or content? I think we see lot of form and very little content, anything gets geolocated and, behold, here’s some cartography… On my part, I’ve been working – I am still working – on several projects I would describe (or that could be described – even though that might be wrong) as sound mappings. And then again it is not exactly that, because for me the cartography has to be a part of the space that the recordings reproduce and not just a map-like packaging. — Moving to something that might be a little more abstract: beyond the question of dealing with a given place, how does your work draws you into questioning the idea of place – that is: the question of ‘being here’, of ‘being somewhere’? When we are listening in a place, or when we are listening to sounds out of context, where are we? The notion of place is necessarily connected to our presence and to the occurring events, and therefore to the site-specific listening we can make. All of it is also strongly connected to temporality and therefore to sound. I would actually say that sound is the best fit as a medium to capture a place, precisely because of that temporal factor. Site-specific listening is an ensemble of stimuli and emotions. They are very real things but they are also something else at the same time, it’s the story of stream in the valley all over again. I would emphasize that, for me, listening is a form of meditation, through which I would explore both the purely acoustic elements (rhythms, textures) and the other things (emotions, imaginations) that are triggered by the first. I might be stating the obvious but this is fundamental. Then the question of the ‘elsewhere’ is a matter of form, rather: I used to work site-specific a lot, a few years back, designing actions and installations for places. Obviously very little documentation remains. Back then, the composition was not so important, and sometimes I’m feeling the need to go back to that initial form. — Instead of compositions for records, which necessarily imply a decontextualization and a re-contextualization in an installation or in the home stereo, you would prefer a site-specific situation of listening, to which an audience could be invited? I am still investigating on this, but that is probably the direction I’m taking for future works. — In your work, there is one very special place: the River. It is altogether the name of a project about the Taurion river that has kept you busy for a while (and for which you have invited a lot of sound artists to contribute to Kaon), it is also a real and an imaginary place, and lastly a concept, a ‘figure’ that concentrates most of the problematics of your work. Your approach as a sound geographer has led you along the continuous but fluctuating lines of the River instead of reporting fixed coordinates… Would you agree to say that this geography you are trying to conceive has more to do with the act of ‘crossing’ than that of ‘marking out’? A geography that would be the result of the experience of the field, of the encounter with the place rather than the produce of the omniscient eye of the satellite; a geography that makes the human scale positive and our inability to see everything…? Definitely. This connects with one of your previous questions: this is a ‘sensible’ approach, and this is happening on the human-scale. From what I can recall, geography was not always considered a ‘science’, because it was inclining a lot on the ‘sensible’ side. There is a constant internal struggle – which, by the way, probably characterizes my work – about how hard it is to find the position and the agreement between what is sensible and what would be reasonable. My position is quite fluctuating, it is mainly a mark of our times: what ‘positive’ things will we keep from our use of today’s technologies, that is, if we are able to sort out the mass of what is available for consumption? What would the act of creation be if it’s only filling an already overflowing bucket?